Notice: this itinerary is used for your reference. The real intineray of yours is based on your vacation duration in Vietnam. Day 1: (Welcome at Phu Bai airport): you will be warmly welcomed by a guide at the Phu Bai airport. After welcoming, driver and guide take you to your hotel. - After breakfast at your hotel, you will be transferred to boat platform to do a boat trip to visit Thien Mu pagoda which is considered the oldest pagoda in Hue city. It was built by Nguyen Hoang lord upon his excursion in Hue to explore more land for his family. Nguyen Hoang lord was the first one of nine Nguyen lords who ruled province of Thuan Hoa (Hue today) from around 1558 to 1777. Nguyen Hoang heard of a local legend, in which a heavenly lady told him that he should build a pagoda on that site to bring prosperity to his country. That is reason why the pagoda was called Heavenly Lady or Thien Mu pagoda. - After visiting the old pagoda and seeing daily life of monks and novices, religious activities of local Buddhists, you continue to visit Khai Dinh Mausoleum by car. The mausoleum with strong French architecture influence was built from 1920 to 1931 by the twelfth emperor of Nguyen Dynasty, Khai Dinh, who was an emperor from 1916 to 1925 when Vietnam was totally controlled by French Colony. Then you go to see Tu Duc Mausoleum which is located in beautiful setting with attractive lakes, pavilions and temples. It was built from 1864 to 1867 by Tu Duc (1829 - 1883) emperor who was the last emperor of Nguyen Dynasty ruled Vietnam in independence (from 1847 to 1883). - After enjoying different architecture of two mausoleums, you will be taken to a local restaurant for lunch with local cuisine. - In the afternoon, you continue to visit the Citadel. It was the last capital of Vietnam. It was built from 1805 to 1832 by Gia Long, the first emperor and Minh Mang, the second emperor. You will have chance to see the Forbidden City where Nguyen emperor family used to live. It is now in ruins and under restoration but it is still very impressive. After admiring other monuments such as; the Royal Theatre, The Temple which is used to worshipped emperors of Nguyen Dynasty, Dynastic Urns, Hien Lam Pavilion, and your guide takes you to your hotel. Finish Hue city tour. Evening Hue traditional folksongs show on Perfume River. It costs 40 US$ for private show in a single (small) dragon boat and 10 US$ to participate with other groups on a big dragon boat. Visit the central market, Dong Ba, in Hue: Free. - After finishing your check- out procedure at your hotel, you depart to Da Nang. On the way, taking a stop at Lang Co beach which has been recognized by Worldbays as one of the most beautiful bays in the world. You continue to go to Danang via Hai Van pass (not available on rainy days). You will have chance to be impressed by stunning outlook on the pass. In Danang, you go to visit Chams Art of Sculpture Museums which hosts hundreds of sculptures created by talented Chams artisans. Then you go to the Marble Mountains to see beautiful and mystic caves in the mountain. You will see some attractive marble sculptures done by local sculptors in the Marble village at the foot of Marble Mountains. Afterwards, drive to Hoi An city for lunch with Hoi An cuisine. 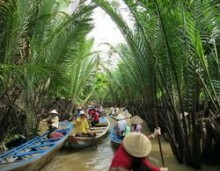 - After lunch, your guide will take you to Hoi An Ancient Town. It has been known as various names: Lam Ap, Faifo, Hoai Pho, and finally, Hoi An. It flourished as trading port in the South of Vietnam and became the major port in Southeast Asia between 16th century and 17th century. You will be attracted many buildings remaining from the past such as; Fujian ( Hokkien) Assembly Hall, Japanese Bridge, Sa Huynh Museum, Phung Hung old house, etc. Hoi An is famous for its incredible state of preservation after many centuries. Nowadays, it becomes a popular attraction for tourists because its beautiful beach, scenic view of the town in the evening, pretty souvenirs, tailor shops with competitive price, friendly and rustic people. After Hoi An, check in your hotel. Breakfast at your hotel. In the morning (around 8 AM), drive to My Son Sanctuary (World Heritage Site). It was a religious centre of Champa Kingdom which was Indiansied kingdom used to be the powerful kingdom in the south of Vietnam. It was built in the late of the 4th century and became a religious capital of Champa kingdom between the 7th and 15th century. The complex of temple-towers were built by Champa emperors in order to decicate to the god Siva to invoke the god Siva’s protection of their kingdom. Even though the over 70 Hindu temple-towers extant are in ruins, they are still very valuable in culture and architecture. Furthermore, the enlivened Chams music show performed by Chams artistes will be available for your pleasure. After My Son holy land, get back to Hoi An for lunch and check in your hotel. Day 5: transfer to Danang airport for your flight. Finish tour.